The performance will be followed by a Summer Solstice Party at Hotel Monaco! Chamber Dance Project, dancers & musicians, is a company of professional artists dedicated to redefining contemporary ballet in partnership with live music in intimate settings heightening the impact on audiences. We are dedicated to sharing our art and exposing it to a diverse audience not otherwise afforded the opportunity. Our work is a celebration of outstanding artists and designers collaborating on works which have a contemporary relevance and resonance. 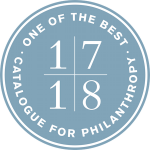 Named ‘One of the Best’ Nonprofits by The Catalogue for Philanthropy: Greater Washington 2017-18. Chamber Dance Project gratefully acknowledges renewed support from the Share Fund in 2018.This general operating support grant provides essential funding that allows our programs to continue to grow and flourish.